Timbercreek Asset Management, currently in the midst of selling the renovated apartment assets of its U.S. Multi-Residential Opportunity Fund #1, is raising money for its second southern go-round. The Toronto-based real estate company expects the #2 fund could swell to about $170 million, enough cash to buy 6,000 to 7,000 units or 20 to 25 buildings. The company’s strategy is simple: buy solid, neglected properties in good markets, spruce them up and sell them a few years later. The approach worked for Fund #1 and there is no reason it will not work again. If anything, conditions look better this time around. “We think there is value there – the economy is doing very well right now – of renovating, creating the value in the assets by spending money renovating the suites and then selling them,” said Ugo Bizzarri, Timbercreek’s managing director of portfolio management and investments and head of U.S. funds. Canadians have targeted the U.S. multi-res sector like never before for a host of reasons: there’s plenty of inventory, it changes hands regularly (unlike north of the border), a growing proportion of Americans rent and the economic signs are encouraging. Timbercreek outlines the business case in its April Fund #1 report – the U.S. economy has more than recovered the jobs lost in the last recession, unemployment is down to 5.6% and the millennials (18-34-year-olds) have a 68% propensity to rent. An added bonus: another 1.6 million are coming of age over the next five years, which will give added impetus to the multi-res sector. Renting rather than owning has also gained appeal because many were burned by the housing crash that came with the great recession and renting also allows people to follow the job market from city to city. Multi-res values are currently 13% above the 2007 peak and cap rates continue to compress in 2014, ending the year at an average of 5.7%. 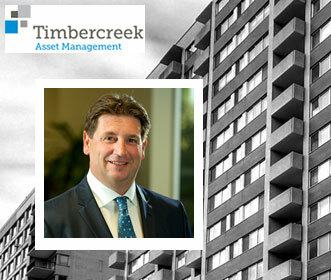 Timbercreek’s eight-property, 2,696-unit Fund #1 portfolio is quickly shrinking. It is in the process of divesting six of the properties and could have all of them sold by the end of the year. Two of its multi-res holdings are currently in the “stabilizing” phase, meaning they are not currently ready for sale. It sold the first, the 476-unit Lynden Square property in Charlotte, N.C., in April for $28.8 million, realizing a return of about 28%. It has two other properties in Virginia and Texas that it expects to sell off in the second quarter. Timbercreek’s model relies on a three-to-five-year ownership model which includes putting money into renovation of unit kitchens, bathroom and amenity spaces of complexes such as clubhouses, pools and gyms. For Fund #2, the company is targeting apartment buildings built in the late Nineties and early 2000s that have had little or no capital spending since construction. Timbercreek has employed a similar value enhancement repositioning program for apartments in Canada since 2007, though the market to buy and sell apartments in Canada is not as dynamic (or cyclical) as it is in the U.S.
For example, prices for apartments actually fell in the U.S. in the dark economic years of 2008 and 2009 whereas Canadian prices held firm, he added. Canada hasn’t added much new apartment stock over the last four decades – unless you count condos as multi-res, but that is changing. Apartment buildings are currently being built, but construction has skewed to the luxury end of the market. Timbercreek, for one, is bucking the trend and is now working on a new apartment project in Mississauga at 1855 Bloor St.